Crock-pots can be wonderful for busy cooks – because you don’t have to tend the pot! They’re also a great tool for beginners in the kitchen who would like to cook more often, but feel intimidated by lengthy recipes with long ingredient lists. If you love tender beef stew, but are scared off by that mile-long ingredient list – try the crock-pot method! Any soup, stew, chili, or goulash can be made in a crock-pot and here are some tips to keep in mind. For food safety, preheat your crock-pot while you prep your recipe. Don’t put frozen food in your crock pot; defrost meats and veggies the night before in the fridge. If you’re using meat in a crock-pot recipe, always sear it first in a hot skillet with a teaspoon of olive oil. Searing the meat first will add a lot of extra flavor and kill any bacteria that might be on the outside before adding it to your pot. This includes ground meat. Always look for a crock-pot with a removable liner. It makes clean-up a lot easier and more sanitary. Add tender foods like soft vegetables and seafood towards the end of cooking, so they don’t overcook. Liquid does not evaporate quickly from a crock-pot like it does from foods on the stove, so go with a recipe that is made for the crock-pot or decrease the amount of liquid by one third. Try a crock-pot dish from nutrition guru Joy Bauer’s latest book Food Cures. Curious about pressure cookers? Learn more from the pressure cooker expert, Lorna Sass and her top selling book Cooking Under Pressure. Try her Chuckwagon Beef Stew with Cheddar-Smashed Potatoes. No time to make dessert and everyone is craving warm apple pie? 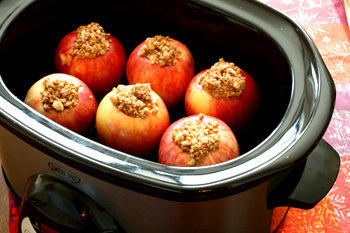 Hot baked apples are as sweet as apple pie and a lot lower in calories and fat. Want to try slow-cooked meals, but don’t have a crock-pot? Try my stove-top favorites like Hell’s Kitchen Chili or Spanish Beef Stew.